The Christmas tree at our state capitol building is donated from someone's garden every year. I missed the official lighting of this giant blue spruce, but stopped for a few photos last night. Temperatures are positively frigid here so I only managed a half dozen shots before I couldn't feel my fingers anymore. Time to start looking for indoor inspiration! Weekly Theme Winner "Tradition in Lights"
Wow! Fantastic capture. I wish I had your skill. That's beautiful, Lisa! 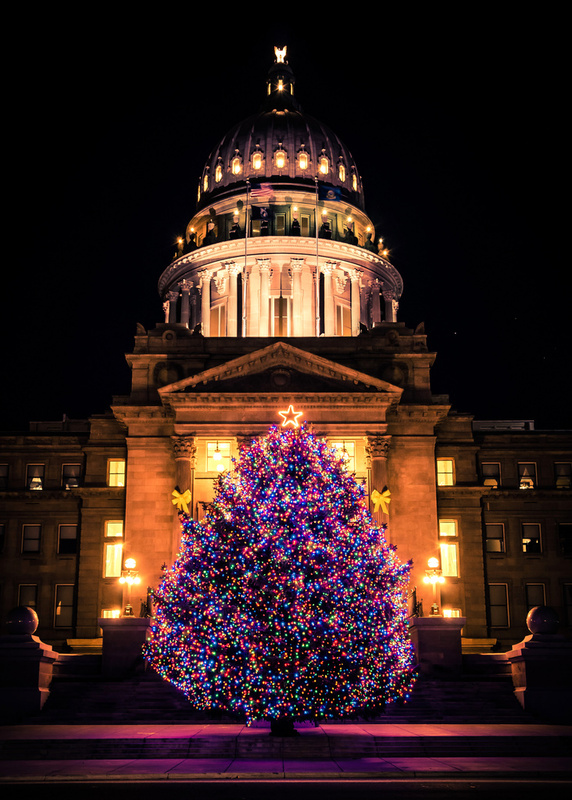 Well captured - love the lights of the tree against the yellow lights of the capitol building. it looks like having thousands M&Ms. So sweet. This is beautiful. The various colors of lights on the tree are set off nicely back the background color and lights within the building. Nicely done. A beautiful shot and fabulous lighting Lisa. Extraordinary! Love the color and the magic of the Christmas Tree! Amazing night shot, and gorgeous architectural composition! How light it is, I mean could there be room for any more lights, amazing! It looks really great and so festive. I´m freezing my fingers too... it´s cold, oh the things we do for shots! Beautiful night shot and pov. Beautiful building and tree fav! This is so beautiful. Excellent composition. FAV. I love the floodlighting on the building - and that is a wonderfully lit up tree! What a fabulous night shot of the tree and the capitol building. I like the POV with one leading to the other straight up. Wow.....a stunning capture.........this is beautiful! Stunning! It would make a great Christmas card for your governor. This is beautiful! The pov is wonderful. Beautiful night shot and a beautiful tree! oh wow! absolutely beautiful Lisa. fav! The shot is beautifully done. But honestly the tree is way over the top for me. Looks like a comic book tree not like a real one. I love the way the tree and the building complement each other and the black background really makes them stand out. Really beautiful color balance and symmetry. Cold here too, but very little snow compared to the surrounding area. love the lighting! and gorgeous colors! fabulous shot! wow gorgeous effect! love the effect of the lights!! Beautiful shot! Hard to believe that someone has frigid weather when ours has decided to return to Spring temps again. What a beautifully lit tree and an amazing building. So well caught Lisa - it was worth the numb fingers! Wonderful symmetry, and what a lot of lights on that tree! Lovely light on the building and I like the glow on the pavement from the tree lights. Gorgeous capture, Lisa. The lights are so pretty and festive looking. Looks so bright and cherry! Love the purple glow. A fav for me, perfectly captured. wow .. this is so beautiful Lisa .. great light ... and very captured ... fav!! What a beautiful shot. Love the light. Fav. Great light and colour. Beautifully shot. love how you set it up front and center. the glow has a wonderful magenta cast...different from the standard! awesome for braving the weather for this gorgeous shot! I'm going to follow you because of this picture. I lived in Maryland for 5yrs and the Capitol Bldg. is my favorite bldg. anywhere. I have a picture, which I took, of the bldg. handging in my office This is a beautiful shot and a FAV for sure. Thank you. Great night capture! That tree's amazing - didn't know you could get quite so many lights on one tree! Is that the Boise tree??? @hopess13 Yes, it is! Do you know it? @hopess13 How cool! I live in SE Boise. Off to follow a fellow Boisean! Wow… there are a TON of lights on that tree!! So pretty! Congratulations on your theme win! Wow wow wow!!!! Theme win!!!!! I'm so excited for you! Congratulations! Love the idea of fences too. @cmc1200 Thank you, Caryn! I really appreciate it! Congrats on the theme win!